It’s never too early to start thinking about what you’re going to carve for your Halloween pumpkin, right? I’ve been thinking it about since about August and I’ve had a lot of great ideas but the one thing that’s stopping me from creating an amazingly awesome dog-themed pumpkin is my artistic abilities. Everything I conjure up in my head seems great but then, when I get it on paper and start tracing it on the pumpkin, I relive the nightmare back to when my dad finally handed over the carving knife and let me carve my first pumpkin all on my own. I was finishing up the mouth, at the crucial teeth part, and I cut the teeth off. I was devastated. My first carved pumpkin ruined and I’ve kept it pretty simple ever since then. Simple is beautiful and it’s not complicated so that’s the theme that I went with this year. 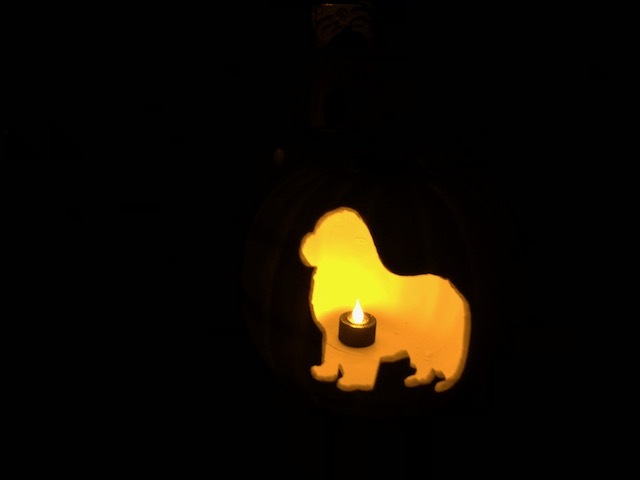 Of course, I wanted to do a Newfie-themed pumpkin and obviously, I wanted to keep it simple. If you’re anything like me, I’ve got you covered this year. 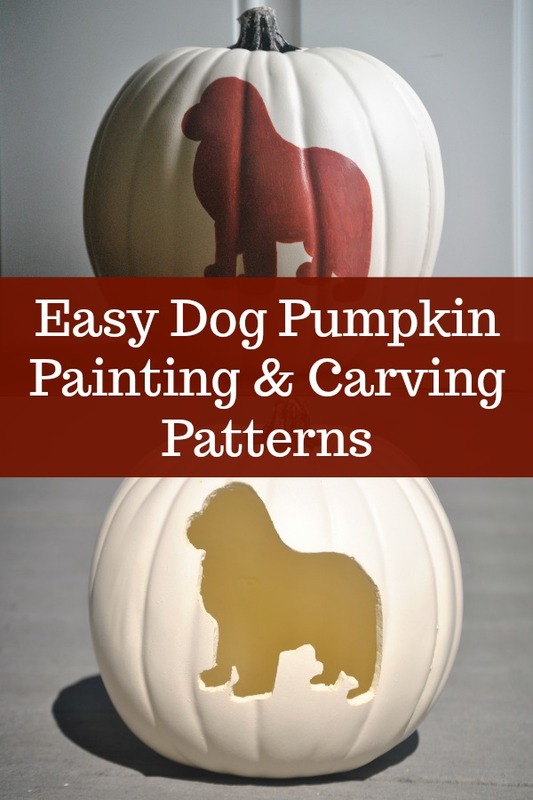 Any of these patterns will work with real pumpkins or artificial carvable pumpkins. I usually prefer real pumpkins but since I wanted to get this done early I decided to go with artificial pumpkins. I’ll do some real ones closer to Halloween but if you’re interested in artificial carvable pumpkins, check your local craft store because many of them are 50% right off now. 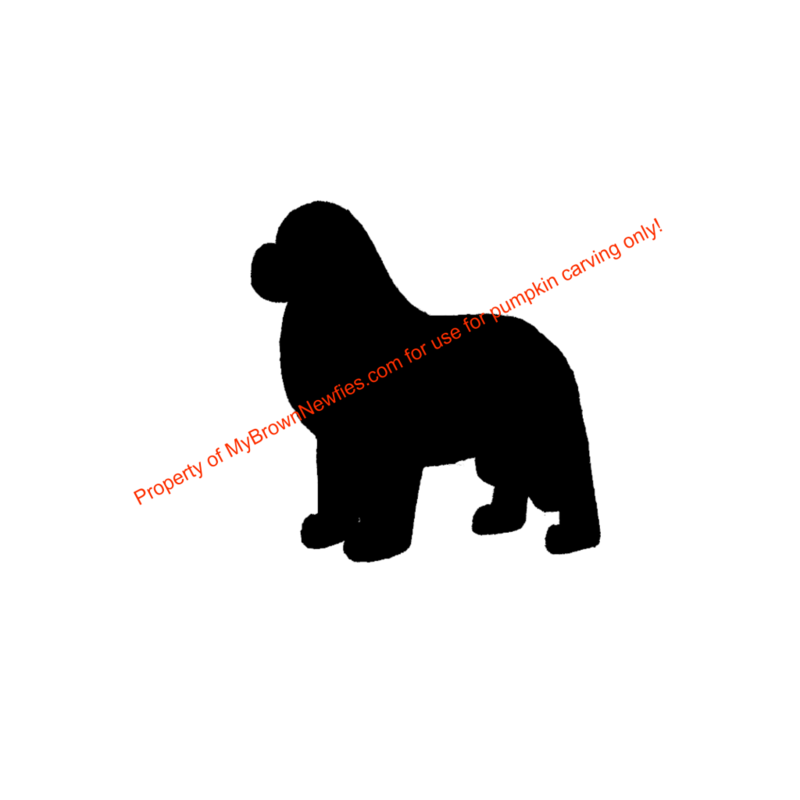 You can also shop around on Amazon for different shapes and colors. 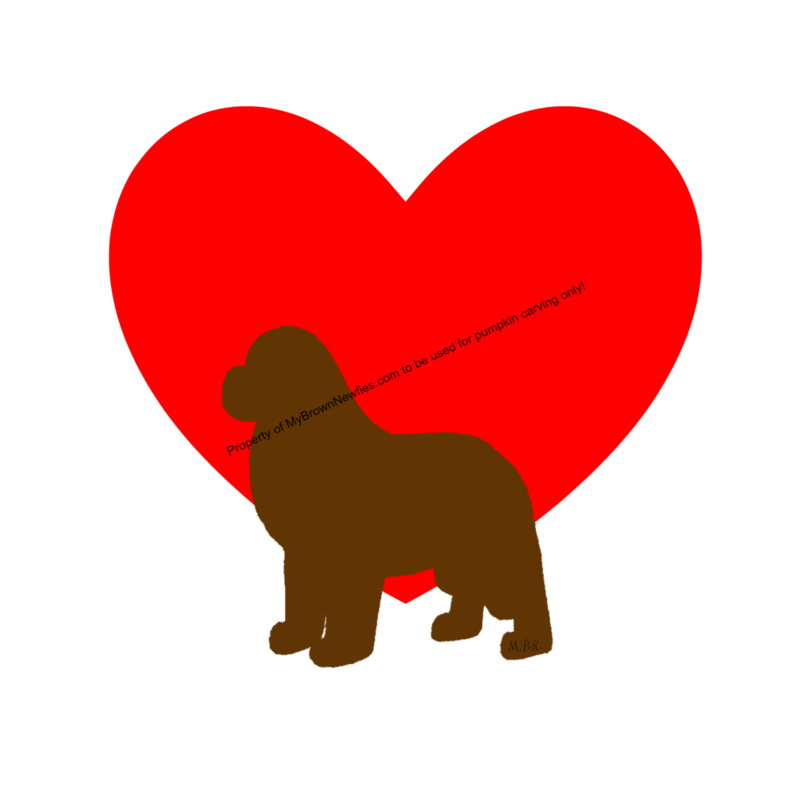 Start by finding a silhouette of the dog breed that you want. You can do this by searching on the internet for (insert breed) silhouette. If you’re a Newfie person, I’ve got some easy patterns and silhouettes that were created by me and you can feel free to use them for personal use! Grab a piece of computer paper and a pencil, right click on the Newfie pattern below and trace the design. 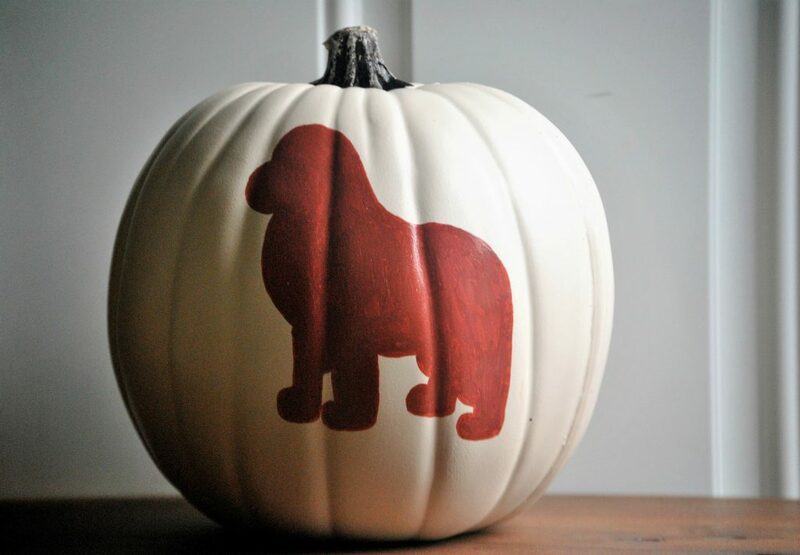 Next, cut out the pumpkin carving dog pattern, tape it to the pumpkin and trace with a pen or pencil. I like tracing with a pencil in case I make any mistakes but this works better on a fake pumpkin over a real pumpkin. 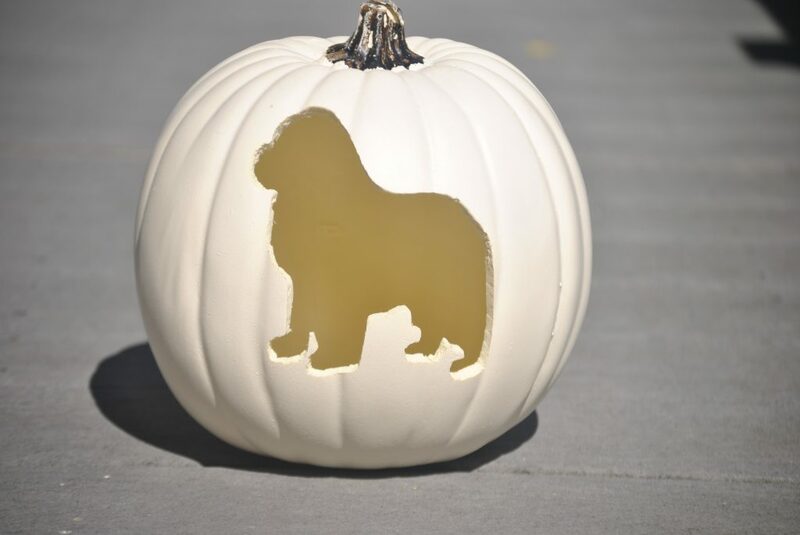 With the easy painted Newfoundland dog pumpkin carving patterns, you can choose whatever color pumpkin you want and whichever type of paint or marker that you would like. Since I have brown Newfies, I wanted a brown Newfie on a white pumpkin. I used an oil-based paint marker because I thought it would be easier than breaking out my paintbrush and bowls. The color was supposed to be dark brown but on the pumpkin, it came out with a reddish tint. 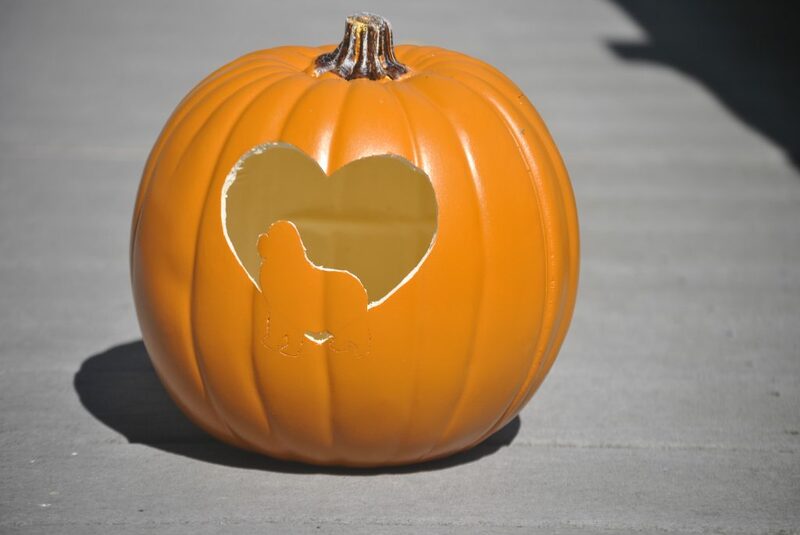 With the easy carving Newfoundland dog pumpkin carving patterns, all you need to do is trace and cut. I used a small carving knife that I had at home and it worked great on the artificial pumpkins but you can also use tools from pumpkin carving kits or any pumpkin carving tool that you feel comfortable with. You can make these patterns all your own too. You can leave just as is once you cut it out or you can add some bling around the edges or even some decorative yarn or twine. You can add polka dots to your pumpkin or you can add more carving patterns to get cool lighting effects. Add your choice of light and watch your pumpkin glow! Make sure you use LED lights or candles for the artificial pumpkins because you don’t want to start your pumpkin on fire! **TIP. Keep the Newfie pattern that you carve out. Later in the week, I’ll be showing you a cool diorama idea you can do with it! **TIP. 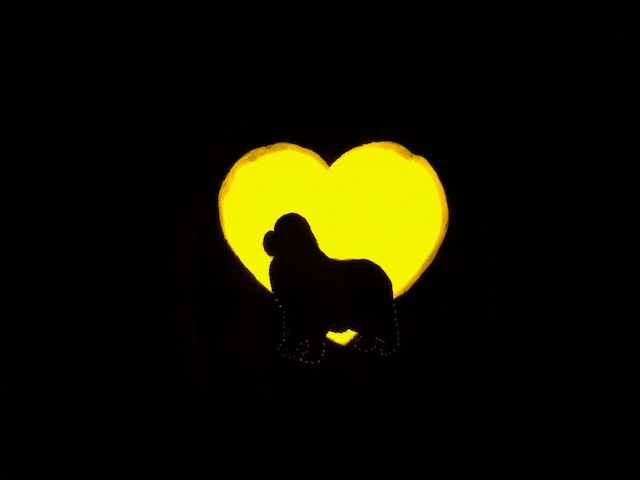 With the Newfie and the heart, I didn’t cut the legs out but instead poked small holes through to let the light shine. 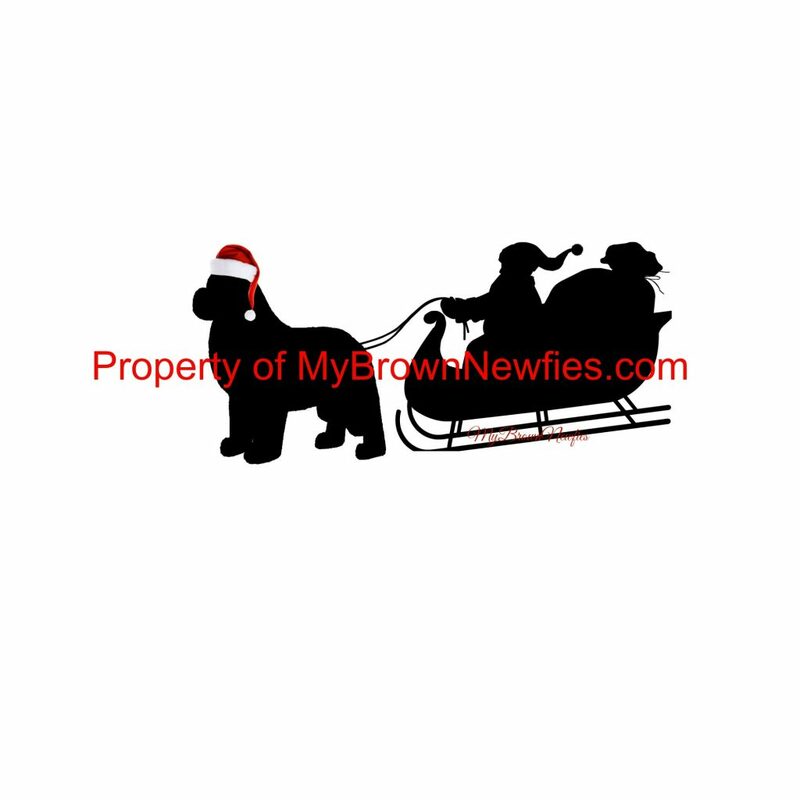 I can’t wait to see what you all come with and if you’re feeling really crafty, here’s a Newfie pulling a sled. I created this image last year for Christmas but thought someone might like to use it for a super cool pumpkin! « Slobber, Sand and Newfies Oh My! Cute ideas! And I love the Newfie sled most of all! I love that last one, with the heart. I’ve been wanting to do a collie pumpkin for a while. But not this year, there just isn’t enough time.